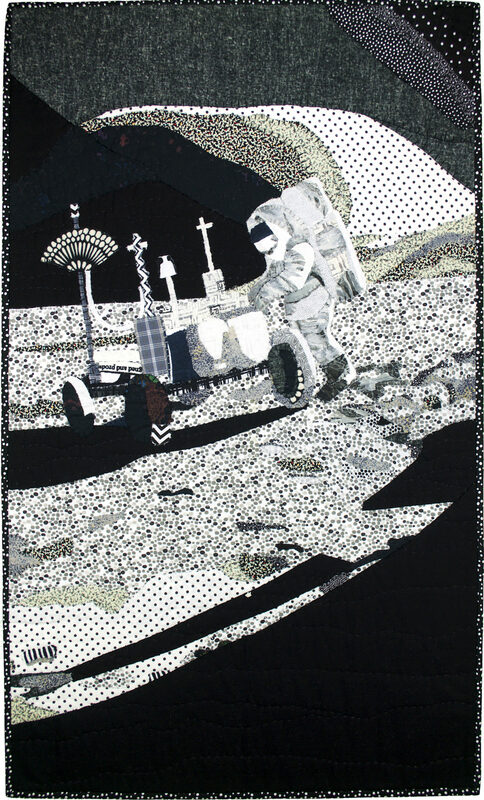 This quilt honors astronaut Colonel James Irwin, USAF. It is based on a NASA photograph taken by Apollo 15 Commander Dave Scott. The photo shows Jim Irwin, Lunar Module Pilot, working near the Lunar Rover. This was the first mission in which the Lunar Rover was used. The astronauts on this mission collected over 170 pounds of lunar material, including a core sample from 10 feet below the surface. 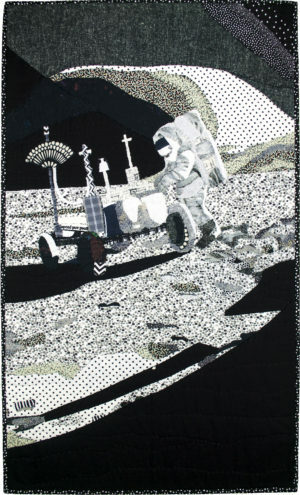 Perhaps it’s no coincidence that a cross symbol holds a prominent place on Irwin’s Lunar Rover in this dramatic image! Raw edge hand applique collage, hand quilted. Commercial and upcycled thrift store clothing fabric, embroidery threads.